Drake is everywhere. Avoiding a news day without an appearance from the Canadian actor turned rapper would be a surprising feat given Drake’s Apple Music deal, news of his latest album on the way, a pending collaboration with Kanye, or even his collaborative efforts with Jordan Brand. (His Air Jordan 12 OVO Black is rumored to drop at All-Star Weekend this coming February). 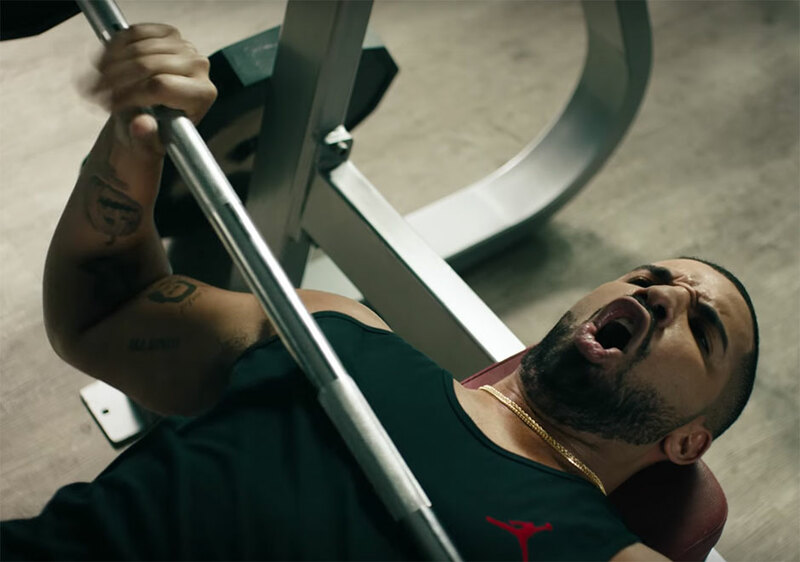 The latest Drake-infused news comes in the form of an Apple Music spot where Drizzy attempts to bench press a little more than he can handle after getting pumped up to Taylor Swift’s “Bad Blood” at the gym. Drake chose to skip out on any of his OVO Jordan collaborations for the limited Air Jordan 12 Wings in the video. While we don’t necessarily agree with his taste in workout music, the footwear selection was on-point. Check out the latest Apple Music video spot below and stay tuned for more of the latest Jordan Brand updates right here on Sneaker News.